Get thee to MakerCon NY 2015 (Thursday, 24 September) &/or World Maker Faire NY 2015 (Saturday, 26 September, and Sunday, 27 September) at NYSCI in Corona Park, Queens (the 1939 and 1964 World Fair grounds). In 2014, a third of all WMF “action” was 3DP-related. Impresario organization Maker Media, Inc.’s (MMI) online documentation highlights many 3DP mentions in the last few weeks. I’d opine that the percentage of Maker Movement 3DP interest — as judged by MMI, the “voice” of the MMovement — has accelerated considerably since last year. Both these Maker “shows” are truly amazing events. 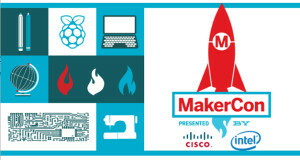 (Maker Media has already produced 150 Maker Faires around the world this year!) WMF — an MMI “flagship” event — is projecting upwards of 100K attendees (2014 was 85K+) in two weekend days… If you’ve never experienced the “alternate” Maker-Movement universe, WMF is THE place to start. Mind-blowing is a phrase too calm. I’m taking my 6 YO grandson for his third year on one of the two days—I’ll be there for both (dawn to dusk, simply too much to absorb)! The growth of 3DP and Healthcare segments — and (Voila!) Brooklyn as “Maker City”! (hey, whatof I been tellin’ youse guys) — continues within the Maker Movement. The email Subject line of MMI’s MakerCon-specific eNewser of 17 September was MakerCon NY: Local Manufacturing, Brooklyn’s Emerging “Maker City” and More. You’ll find six Brooklyn-Maker-focused articles (five of them with videos). Further — reflecting the 3DP and Healthcare boom within the Maker Movement — World Maker Faire again enjoys a separate and enlarged “3D Printer Village” and now a “Make: Health” area. Can you make our HCx3DP/Health Maker Lab Meetup on Tues Evening, 29 September, 6:30 PM, at CityScience (68 Jay St.) in DUMBO? Just wanted you to know that I’d love to have you joining-in our Community meetings in person next week! As you see from the updates below, we’re making real, sustained Health Maker Lab (HML) progress! Now — more than ever — we need your insights, expertise and connections to help assure HML launches as a prototype of bio-grassroots success. That’s social commerce and common-good — for ALL of our various communities. Including the communities you’d like us to serve… Just let me know and I’ll be happy to admin-comp your admission — gratis. Further, WMF has set up a separate and enlarged “3D Printer Village” AND a “Make: Health” area at WMF. I’d knew that Jose would be speaking WMF and figured it would have to do with Making Nurses — because this project is bankrolled by his sponsor the Robert Wood Johnson Foundation (RWJF). Voila! Jose is presenting on “Launching a Medical Maker Space!” along with Lori Melichar, Jose’s benefactor at RWJF (whom I also know). Through the good work of Jonathan Askin, of Brooklyn Law, we now are working with his CUBE (Center for Urban Business Entrepreneurship and for which Jonathan serves as Faculty Chair and Innovation Catalyst) to form our Not-for-Profit status. This is via CUBE’s Community Development Clinic and Research Director David Reiss. I’m now meeting with our CUBE Team for HML Project kick-off on Friday morning this week: progress! Further to HML’s NfP effort, we now also enjoy the active assistance of Grassi & Co. Grassi — via the excellent in-house “championing” of our HCx3DP Community member Guido Gabriele — is supporting our success in these several areas. Grassi is a mid-sized, tri-state firm ranked in the top 25 of such accountancies nationwide; they’re also ranked among the top 10 Best Companies to Work For in NYState. Here is our HML Workshop #3 video (a little over 1.5 hours!) of your fellow HCx3DP-Community Members working to help implement HML in July. Structured by a slide deck intro’ing our HML Manifesto #1, you’ll find lots of interesting ideas here. Our next HCx3DP Meetup will focus on our HML Workshop #5 on 29 September. Your fellow HCx3DP-Community Members — working with our audience — will continue to help implement HML. We’ll present a new slide deck to inform and guide our HML discussions. This entry was posted in Email, HOME, How-Tos, Video, Views. Bookmark the permalink.